This photo of our courthouse is housed at the Library of Congress. It’s one of only a handful of known images that show our town square under occupation during the Civil War. 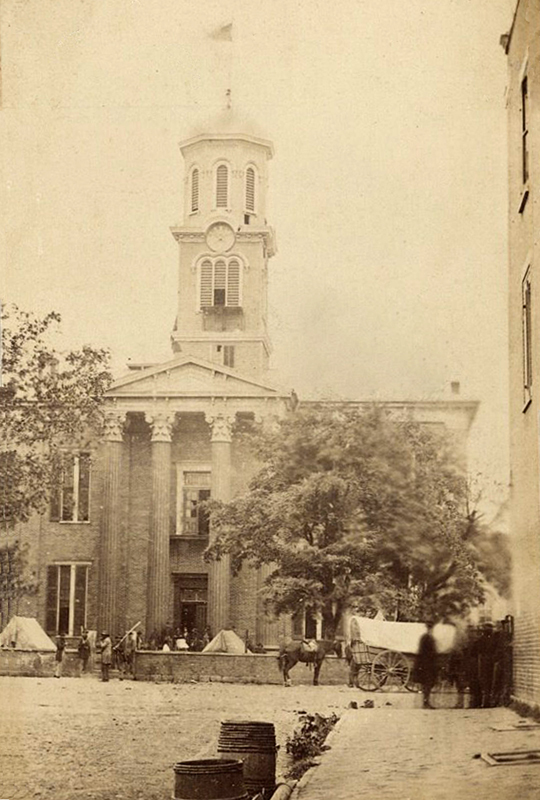 Our courthouse was literally brand-new during the outset of the war, being completed one year earlier in 1859. It’s hard to see, but there appears to be a US flag flying from the cupola of the courthouse in this image. Assuming this flag means that the town was already occupied by Federal troops, we can better assume a possible year the photo was taken. Federal forces first occupied Murfreesboro on March 10th 1862. Control of the town was briefly traded only four months later, on July 13th 1862, when Colonel Nathan B. Forrest raided the town at dawn and overpowered the Federal troops from Minnesota and Michigan. Five months later, after the Battle of Stones River, the town would be occupied again, for the remainder of the war. So, we can assume this photo was taken during the 2 years and 9 months span of occupation. John C. Spence paints a vivid image for us in his diaries of that era. He writes of the troops marching to the square on January 5th 1863 with “Bands playing and starry pendants fluttering in the breeze; prancing studs chomping bits and riders supporting drawn swords as an emblem of authority”. He goes on to describe how the soldiers descend on the town to forage for food, saying “they began destruction on their four-footed beasts, without consulting owners. Cattle, hogs, sheep, poultry, and anything that may come in the way, hunger having no bounds”. The following weeks and months would see things get much worse for the townspeople of Murfreesboro as the foraging army continued. Spence also writes about the army sending trains out into the county daily to load them with corn and hay and seldom leaving anything behind for the property owners. Food wasn’t the only resource in high demand. The occupying army also helped themselves to lumber, bricks, and fence rails from homes, churches, and outbuildings. Nothing was sacred, as evidenced by the complete dismantling of the Presbyterian Church. Officers occupied downtown homes making use of them and their furnishings as they saw fit. Many of the churches and schools were used as hospitals. This total occupation of the town is hard to comprehend. But documentation through journals and diaries compared with official records and census data help us understand just how terrifying it must have been. Murfreesboro had a population of around 2,900 people in 1860 and the Battle of Stones River saw roughly 42,000 Federal troops. In the aftermath, there were 23,000 killed or wounded. Bottom line is that every man, woman, and child were so supremely outnumbered and outgunned by the Federal troops that resistance was truly futile! The occupation of Murfreesboro didn’t just affect the soldiers; but the wives and children and those most helpless to defend themselves. These are wounds that take generations to heal. But even though we are now generations past the Civil War, it’s likely wise to not forget them completely. To avoid such tragedies in our future, we must take lessons from our past. And so to this day, there is a monument on our public square; and it’s message is perfectly simple and open to interpretation. “Lest we forget”.